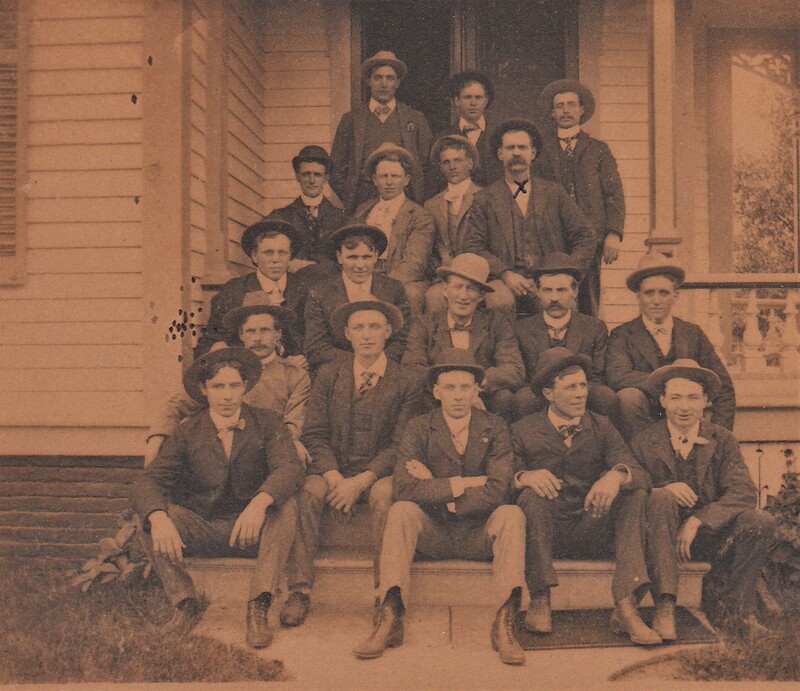 The first fire company was organized in Creston October 3d, 1873, and was composed of fifteen men, and adopted the name of the "Creston Fire Company." The names of the pioneer company, as recorded at their first meeting on the evening of the above date were: A.D. Temple, foreman; N. Hogue, first assistant; Geo. Grane, second assistant; N. Cory, captain hose; Fred Cook, assistant, W. J. O'Brien, foreman hook and ladder; O. Holloway, assistant; John Snedeker, foreman bucket department; J. P. Wilson, assistant; H.M. Way, treasurer; E.S. Seeley, secretary; Samuel Whitmire, steward. Firemen without title, Hugh McGannn, Alex Kerr and John Augustine. At this same meeting the company petitioned the council to aid them in procuring a fire engine or some suitable machine for extinqishing fires. The second meeting was held January 29, 1874 and the pioneer firemen felt considerable encouraged as the council sent them word they had purchased a Village No. 2 chemical fire engine, which would arrive about February. Their regular meetings were set for the first and third Thursdays of each month. Be it Resolved: That we, the Creston Fire Company, hereby return our sincere thanks to the honorable town council and citizens of Creston for placing this valuable machine in our care, and we assure them we will use and preserve the same to the best of our ability. About a month after its arrival the firemen had an opportunity to try it on a fire at the city calaboose, which was probably set on fire, as it was saturated with coal oil. The members of the company were promptly on the ground but not being used to working the engine, made several bad moves, shooting the solution on top of instead of underneath the fire, and attaching hose to both tanks at the same time. The fire was finally controlled and extinquished with the loss of the roof of the building and considerable other damage to the structure. ON August 17th, the company lost is first member by the death of Samuel Archer. The company attended his funeral in a body and draped the engine house and machinery in mourning for thirty days. On Sept. 19, 1884, a fire occurred in the Lassaux building on lot 837 at which the fire company did excellent service in extinquishing it and was presented with a check for $50 by Gen. R. Smith in acknowledgement of their valuable services. At the annual election of officers, January 7th, 1875, A. D. Temple was continued chief; C. W. Fahlsing was elected first assistant, and the other officers were continued the same as before. In this year there were four fires---the Democrat office February 28th, the Douglass saloon March 4th, I. Grantz' house, October 29th, and the Raybourn house December 14th, none of them of much consequence. The men were always promptly on hand and worked the apparatus to its fullest capacity. May 11, 1875, the firemen held their first annual parade, after which they gave the public an exhibition of their skill, on the Adams street common, and closed the day's program with a grand ball in the evening. About this time the city council purchased a Babcock hook and ladder truck which cost about $750, a hose cart at a cost of $250, 1000 feet of hose and couplings at $675 and built the present engine house, which cost $1300, making a total outlay of $2075. The engine house has since been removed from its former position at the union of Adams and Maple streets to No. 207 North Maple Street. At the annual election, January 10th, 1876, about the same officers were re-elected. On January 13th there was a fire in the C.B. & Q sote house where good service was again done by the company. About May, the need of a team having been sadly felt, one was purchased by the council. In July the company received an invitiation to attend the state tournament at Burlington, and receiving free transporation from the railroad company for services rendered, for men and apparatus, the company went and completed for prizes, some of which they brought home with them. About the same officers were elected in 1877 at the annual election, and the membership had wonderfully swollen on the books, numbering 106, and between that time and February, thirty names were stricken off for non-attendance at meetings. April 24th, A.D. Temple resigned as chief, and on August 2d, was unanimously elected honorary member, and C.W. Fahlshing was elected to fill vacancy as chief. June 9th the third annual parade and ball was held, House Company No. 1 participating. AT the January meeting, 1878, C. W. Fahlsing was reelected chief; H. M. Way, first Asssitant; T. P. Johnson, seond assistant; C.S. Res, foreman engine; R. N. McCleery, assistant, Samuel Diven, foreman hook and ladder, and H. Taylor assistant; O.H. Reeder, foreman of hose, E. J. Bush assistant; Geo. E. Spalton, secretary; D. H. Ettien, treasuerer; C. H. Akers, engine keeper. Spalton resigned as the April meeting, and C. S. Rex was eleced in his place. On Tuesday, May 7th, the annual parade and ball occurred. On May 15th the Creson elevator Hook Fire and department attended, but could do no good as the fire had too great a start. On the 19th the members extinquished a fire at C. B. & Q. railway company's store hosue and offices. About this time a triangle alarm was purchased. About the same officers were continued during 1879 and 80 and the annual parades were successfully given. At the annua meeting in 1881, C. W. Fahlsing was elected chief, Nelse Hogue first assistant, J. P. Harvey second assistant teamster, C.S. Rex, foreman of engine, Rob't McCleary assistant, John McCaffrey foreman hose, R.E. Taylor assistant, John Hatton foreman of hook and ladder, Sam Divin assistant. In April 1881, the members of the department, were provided with new uniforms and appeared in them at the eighth annual parade on May 6th. The members attended the tournament at Council Bluffs in June, and did the city credit. 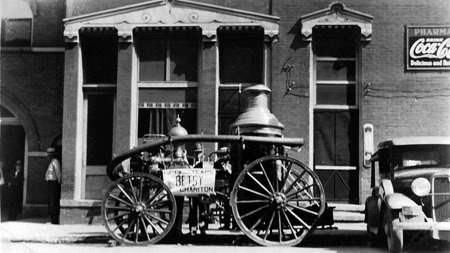 During 1881 a new hose cart was purchased and also the new fire bell now in use. The doings of the department from 1882 to the present time are fresh in the minds at all times been highly regarded by the citizens of Crestonds of the people and will in the after years, rather than at the present time, from an interesting chapter in the history of the organization. A small loss of property holders, which without the prompt and efficient services of the department, would have desolated the city and its alone due to the good work of the organization that no extensive confilagrations have occurred. The department has at all times been regared by the citizens of Creston, for its grateful and geratitious work. The annual parade day, which occurs on the first Thursday of May, is one of the most generally observed holidays of the year, heartdily appreciated and observed holidays of the year, heartily appreciated and participated in by all classes and ages. At the present time the department comprises about eighty-four members. It is divided into three hose companies---two hand and one horse, a book and ladder company and an engine company, three two wheel hand hose carts and one four wheel carriage drawn by two horses, all well supplied with best of hose. It has a double fountain Babcock fire extinquisher drawn by two horses. A telephone system of fire alarm is employed. The names of the present officers of the department will be found in the classified directory of societies. The picture to the left is of Creston Volunteer Firemen. The only person identified is Raleigh "Rolla" Emerson Taylor (with the "X" on the neck). The R. E. Taylor in the above paragraph MAY have been Raleigh. The picture was probably taken between 1871 and before 1912 when Roleigh died. Can you name anyone else in the picture? If so, email me at ksparmenter@gmail.com. The members of the Creston Fire Patrol met in regular session Wednesday night with Capt. McCaffrey presiding. Roll call showed several absentees. The minutes of last meeting were read and approved. On motion, the Patrol masquerade was postponed until Easter Monday. Jno. Braunberger was added to the committee of arrangements. On motion four prizes were to be offered, two for the best costume worn by lady and gentlemen, and two for best comic costume. Mr. George Besten was elected a member of the company, and no action was taken on the name of H. A. Hall. On motion the price of admission to the coming masquerade was fixed at $1.00 for gentlemen and 50 cents for ladies. A communication from J. C. Godill in regard to badges was ready by Secretary Rosenthal and he was instructed to write again. A bill presented by S.A. Brewster for printing, $1.50 was allowed and ordered paid. J. H. Patt's bill, $5.00 for stoe, was ordered paid. On motion Messrs, McCaffrey and Hogue were appointed a committee to interview H. F. Hamilton in regard to hall room. The names of W. Green and S. K. Boslough were presented for membership, and messrs. Pfeiffer, Dawson and Lampsheir were appointed as investigation committee. The name of E. Sheridan was dropped from the roll for non-attendance. The following officers were then elected: J. McCaffrey, captain; N. Hogue, 1st Lt.; J. C. Duncan 2nd Lt.; S. Johnson, 3r Lt.; A. McNiel, 4th Lt.; J. W. Snively, drill Sgt. ; N. Hogue, treasurer; D. A. Rosenthal, secretary.